Simple, no maintenance design is built to last for years. Feed deer the easy way...with gravity. No need to set timers, just fill up the hopper and this durable Gravity Feeder does the rest. The UV-stabilized polyethylene feeding container is maintenance free and has no mechanical parts, so it'll never break down in harsh weather. Simple, single post design allows deer to feed easily and without obstructions. It's easy to set up, too. Simply bury any 8-ft. 4" x 4" post 3' into the ground. This leaves the 4 feeding ports at an optimal height of 42". Great for managing and improving the size of bucks and does in your area. 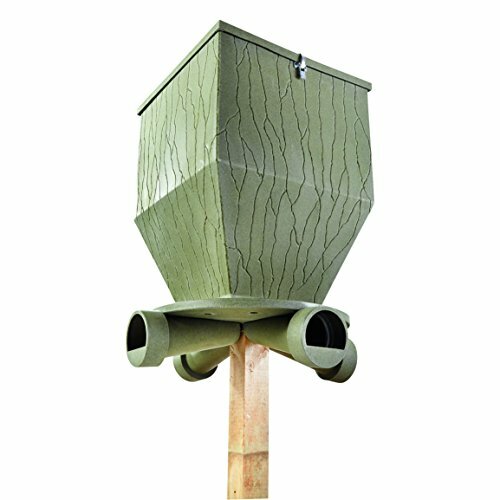 UV-stabilized polyethylene feeder is durable and weatherproof; Gravity-fed means no mechanical parts that will fail in harsh weather conditions; 4 adjustable feeding ports to control food flow; Center pole design allows bucks to feed with no obstructions; Sealed overlapping door is WATERPROOF and keeps food fresh; 300-lb. capacity; Mfg. Number: FB275.